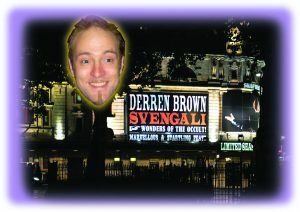 Derren Brown’s television shows are both fascinating and disturbing to watch, as they highlight something we usually prefer not to think about – how open we can be to manipulation. The ‘psychological illusionist’s stunts often involve making people ‘choose’ to do exactly what he’s conditioned them to. In Brown’s latest experiment – Sacrifice (Netflix) – his aim is to manipulate his subject into willingly taking a bullet for a complete stranger. He makes this even more of a challenge for himself by choosing someone who is openly against immigration to sacrifice themselves for someone in the country illegally. Not that Phil, his subject / guinea pig / victim, knows this is going to happen. Instead, Phil is told that he’s taking part in a documentary about a new microchip which he agrees to have inserted in the back of his neck. He believes this will make him more confident and decisive, but in reality there’s no microchip and it’s Phil’s conviction, along with Brown’s conditioning which create this attitude. Phil comes to associate a trigger sound and a tap on the head with being fearless and even not feeling pain, demonstrated when a needle is pushed through his hand. Brown also needs to make Phil develop more empathy, especially with people from other backgrounds. Fortunately, his methods here are more honest and benign. To change how Phil sees himself as all-American, a DNA test is arranged which reveals that his heritage stretches back to Scandinavia, Russia, the Middle East and, significantly, Mexico. Even more powerful is a simple exercise where he and a stranger maintain eye contact for four minutes, which ends with tears and a hug. Phil is told that the therapy and the filming are over, and several weeks later Brown tests whether his real plan has worked. In the middle of the Californian desert, he sets up a fake bar, rigged with hidden cameras and actors playing its staff and customers. It’s engineered that Phil is driven out there and gets befriended by a group of what he thinks are racist bikers. He joins them as they drive off in pursuit of some Mexicans also in on the stunt. The Mexicans are caught, are made to admit they’re in the country illegally and the bikers get ready to shoot them. Waiting in the van, Phil hears the trigger sound played through the radio. He decides to intervene, and indeed stands in front of the Mexicans when the biker fires his gun. Brown rushes out and tells him it’s all been staged. Phil’s relief that he hasn’t really been shot dead presumably overrides any understandable urge to punch Brown’s lights out for what he’s done. The formula of conditioning someone and then surreptitiously testing its effectiveness was also used in Brown’s 2006 show The Heist. Under the guise of a motivational seminar, Brown implanted the urge to rob a security van in a bunch of middle-managers without them knowing. He instilled in them a ‘just do it’ attitude, associated with the colour green, a song by the Jacksons and the action of rubbing their leg. The seminar was deliberately peppered with words to subconsciously promote taking money, and each of the attendees were given a toy gun to symbolise their new-found gung-ho outlook. Without the attendees realising, he then tested which were most receptive to authority, and therefore would be more likely to accept his manipulation of them. After challenging them to steal some sweets from a shop, he moved on to re-enact the notorious Milgram experiment, carried out at Yale University in the 1960s. In this, volunteers are asked to administer electric shocks to someone as a punishment for getting answers to questions wrong, unaware that the shocks aren’t real. Over half of Brown’s middle-managers gave what they thought were lethal doses, just because someone wearing a white coat told them to, a result similar to that of the original Milgram experiments. As with Sacrifice, the actual point of the exercise took place next, when the participants thought they were no longer being filmed. The four who were most suggestible were each invited to a meeting and asked to bring their toy guns with them. Concealed cameras filmed them in turn walking to their appointment in London, past a green poster of a leg captioned ‘do it’, as a car drives along blaring out the Jacksons song. So when the subjects see a (fake) security van parked ahead of them, they’re unknowingly primed to act on all the cues they’ve learned. Three of the four instinctively pull out their gun and hold up the (actor) security guard, running off with the money until Brown stops them. Brown’s stunts make it look easy to manipulate unwitting people to commit acts as extreme as armed robbery, self-sacrifice and, in 2016’s Pushed To The Edge, shoving someone else off a height to their apparent death. The set-ups may be elaborate, but his techniques – placebos, triggers, conditioning – are unsettlingly straightforward. He doesn’t say that everyone can be so easily moulded, though, as he selects people who are most suggestible and receptive to authority. So is Brown warning us about the dangers of allowing ourselves to be led? He says that his latest show has ‘an ultimately humanitarian message … about stepping out of the [political or social] narratives we live by’ (NME, 15 October), such as Phil’s nationalism. Brown rightly points out that these narratives can be limiting and divisive, and that we can become kinder to others by changing our outlook. Showing a die-hard xenophobe apparently giving his life for someone they would otherwise hate is a drastic way of demonstrating this, and manipulating them into it is a strange and contradictory way to make the point. This seemingly hasn’t bothered those who have taken part in Brown’s stunts, who he says have found the experience ‘the most positive and transformative thing they’ve done.’ If, like them, we excuse how Brown’s techniques are deceptive and even cruel, he teaches us some interesting lessons about how our thoughts, values and actions can be shaped.